Website visitor Tom J. wrote to request that this article for the "Push-Air" CO2-powered free flight model be posted. Designed by Frank Ehling, it appeared in the February 1970 edition of American Aircraft Modeler. The 19" wingspan almost seems large for such a tiny motor - the 0.005 cubic-inch Brown Junior CO2. 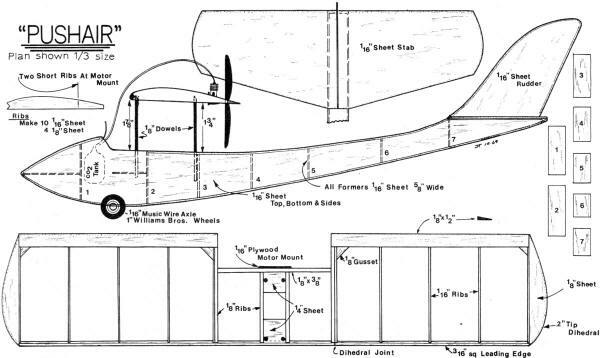 Built-up stick and tissue construction could replace the 1/16" sheet balsa fuselage sides and tail surfaces to save a little weight if you want a little extra flight time. 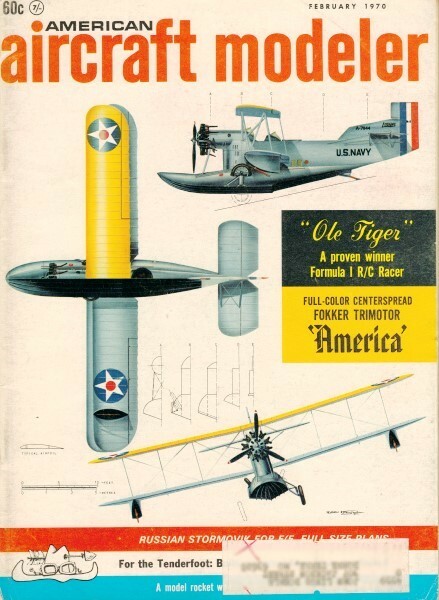 See the "Fizz-Wizz" article from the March 1962 American Modeler and my DP-03 CO2 motor. For the new Brown Junior .005 CO2 engine, a wee cutie that can be flown in parks - or even indoors! 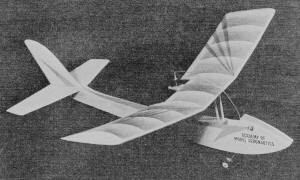 Patterned after the old Curtiss-Wright Junior, Push-Air is an extremely stable, slow flyer, thanks to its parasol wing. The wee engine is merely cemented to the firewall. The firewall cements to the trailing-edge center-section. No bolts - not even fuel-proof cement needed. CO2 containers are hidden in spacious nose. CO2-powered models are not new. Herkimer and Campus once mass-produced such engines, and CO2 power was once a National contest event. 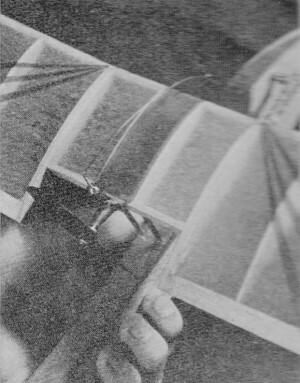 The model shown here was made overnight to demonstrate a new motor. Now Bill Brown, of the famous Brown ignition engines of the 1930's and early 40's, has come up with another winner - a tiny "mill" called the Brown Junior .005 CO2. Its displacement is .005, or 1/200 cu. in. Weight is 1/10 oz. with hardware. The engine can be run at various speeds; it's a simple job to turn the head to adjust to the rpm desired. Price is $24.95 with tank. The loader costs $5.95 but also can be used with the Brown jet engine, available later. One big advantage over a glow engine, of course, is lack of noise; great for those who have to fly in a city park. Another advantage is its cleanliness of operation. It allows one to make a simple model and not accumulate weight with a lot of fuel-proof dope which can warp light structures, causing all sorts of flying trouble. Furthermore, piston-powered indoor flying is again possible. Push-Air is simple to build. Use light balsa throughout. Build the fuselage by cementing the bulkheads to one fuselage side while it is lying flat on the workbench, and then cement the other side on top and weight it down until dry. Then sheet cover the top and bottom of fuselage. The dowel wing struts are simply poked through the fuselage top, and cemented. After the wing is built and covered with tissue, paint with dope that has been cut 50% with thinner. Make the holes in the 1/4" sheet to accept the other end of the wing struts, and cement well. The engine is just cemented to the plywood engine firewall, which is cemented to the center of the trailing edge. Slip the CO2 containers in place and cover that portion of the fuselage. A simple wire axle with wheels is cemented directly to the bottom of the fuselage. Use several coats of cement. Flying is easy. Using thrust adjustments for turn, do remember that on a pusher, the down-thrust adjustments are opposite to those of a tractor. Since the engine can run in either direction, merely turn the prop around with the flat of the blade to the rear. The engine can best be enjoyed in a nice scale job. This simple model will serve as a guide to size and weight for such a project.